Students at all four campuses of the University of Ulster will be ‘making a difference’ this week during the University’s first Student Volunteer Week (SVW). Part of a nationwide initiative, SVW, runs from February 11 – 16, and encourages those in higher education to make a difference to local communities, organisations and charities,while gaining great skills and experience for the workplace in the process. BreandÃ¡n Kearney, the Students’ Union’s Volunteer & Societies Coordinator, said: “This is the first year that the University of Ulster Students’ Union are celebrating SVW and we are really excited with the diverse programme on offer. “There’s an eclectic mix of activities including the ‘campus litter pick’ at Coleraine, and an ‘Ideas Drop’ at Magee, where the SU Advertising & Marketing Society will volunteer to give students help with marketing or promotional ideas. “Our Christian Union in Jordanstown have volunteered to run an I-CafÃ© for international students to help them practice their English and our Cumann Gaelach in Magee have volunteered their time to give free Irish language lessons. “Workshops include skills-based sessions on ‘sighted guiding’, ‘volunteering with families and young people’ and ‘impressing employers with your volunteering’ as well as safe-guarding and capacity-building training. “The organisation, Volunteer Now will also be coming to all four campuses to give students the opportunity to sign up to one-off, ‘turn up and try’ taster volunteering projects with organisations in their community. 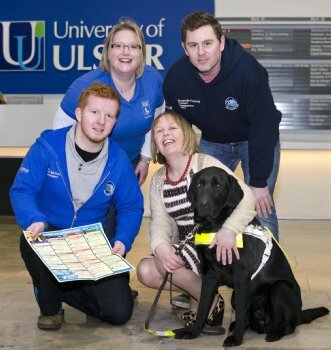 Community Engagement Officer for Guide Dogs NI, Arlene Verner said: “We are delighted to take part in the University Of Ulster Students’ Union Student Volunteering week, providing students with an opportunity to learn practical skills that can make a life-changing difference to the lives of blind and partially sighted people. “Guide Dogs NI will be offering workshops on Community Sighted Guiding, which is a practical training course endorsed by Vision 2020 and developed by a consortium of 17 different organisations for blind and partially sighted people. National Student Volunteer Week runs from February 11 – 16, 2013. Full details of University of Ulster events can be found on the UU Student Union website (www.uusu.org). You can also stay up to date with what is happening throughout the week on UUSU Facebook page (UUSU Volunteering Centre) and on twitter (@uusuvolunteers).